Born in the small south east Austrian village of Rohrau on the river Leitha, near the border with Hungary, Joseph Haydn was one of three brothers who were to become eminent musicians. Their father, Mathias Haydn (1699-1763), greatly respected in the community, was a master wheelwright, and functioned as village Marktrichter (magistrate). According to Haydn himself, his father was 'a great lover of music by nature', who 'played the harp without reading a note of music'. Aged six, Haydn left home for Hainau, where harpsichord and violin lessons began under the direction of Johann Mathias Franck, a relative by marriage. Aged seven, he was recruited to serve as a choirboy at the Stephansdom in Vienna, and there for the next ten years (his brother Michael joining him in 1745) his musical talent was nurtured amid the pomp, the splendour and the musical tradition of a great cathedral. 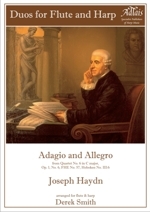 There, as Haydn himself states, he remained 'until into my eighteenth year', but when his voice broke he was obliged to leave, and to learn to depend upon his own resources. So it was that, renting an attic in the Michaelerhaus, he continued to study music whilst supporting himself with occasional work as harpsichord accompanist, singer, violinist and teacher. Aged 21, an important figure who came into his life was the Baron Karl Joseph von Fürnberg (1720-1767), a music-loving aristocrat who employed Haydn as music master to his children, and invited him to his palace at Weinzierl, near Wieselburg in Lower Austria. It was there that Haydn - with the palace priest, the baron's steward and cellist Anton Albrechtsberger (b.1729, and an older brother of the composer Johann Georg Albrechtsberger) - played the first of his string quartets. In 1758 the Baron von Fürnberg recommended Haydn to Count Ferdinand Maximilian von Morzin in Lukavec (now in Czechoslovakia), and then in 1761 he became assistant Kappelmeister to Prince Paul Esterházy (1711-1766). On the latter's death, he was succeeded by his brother, Prince Nikolaus (1714-1790), and when the new Esterházy palace was opened in 1766, Haydn took over as Kappelmeister. Greatly loved, over the years Haydn became known as 'Papa Haydn'; equally, he was also recognised all over Europe as 'The Father of the String Quartet'. Over a period of fifty years he composed no less than sixty-eight quartets, but it was at Weinzierl, with the earliest of these, that he had established the form, taking the soloistic ensemble for granted, including solo cello without continuo, establishing a five-movement pattern and laying the foundations of the genre as we know it. Haydn's quartet movements at this period consist to a large degree of 'tune with accompaniment' which lends itself to arrangement for solo melodic instrument with harp or keyboard. From these delightful early works, Derek Smith has selected pairs of contrasting movements which seem to follow one another in natural sequence, and which he believes best suited to the instrumental combination of flute and harp. While there has never been any doubt that Hob.III-6 is by Haydn, the quartet Hob.III-17 (containing the famous 'Serenade' ) has sometimes been attributed to his contemporary, Roman Hofstetter (1742-1815). 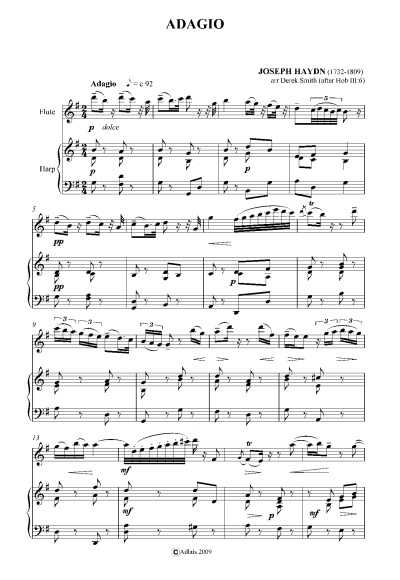 However, as this quartet appears in the thematic catalogue of Haydn's music compiled by Eissler in 1765, the alternative attribution appears less than likely. Indeed, performers on flute and harp have little reason to doubt that both Hob III-6 and Hob III-17 come from the series composed for the Baron von Furnberg at Weinzierl in the mid to late 1750s. "Derek Smith was in the audience to hear his own arrangement for this combination of flute and harp of movements from two of Haydn’s early String Quartets. As always, Derek’s work is well worth hearing - and enjoying. He appreciates the humour that is more present in music of the “Classical” Period than we today are willing to recognise, in Haydn, and Beethoven, and Mozart. (Alfred Brendel’s two essays on the subject are recommended as essential reading.) Here is music being wittily and cleverly rescued from undeserved neglect, and the arranger has come to the task with affectionate skill, emphasising that enjoyment and pleasure are there for our taking, if we can kick our habit of taking too much music too seriously. More power to his cunning ear and pen."